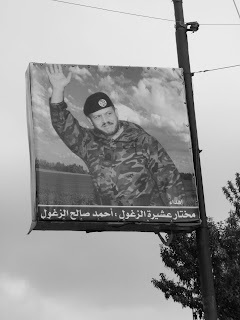 The King of Jordan in Camo. I’ll admit it…there’s something ironic about going to Jordan for Rosh Hashana. 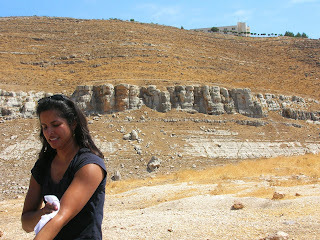 But, my friend Naz, who works in Amman had 4 days off for Eid al-Fitr [the end of Ramadam] which, this year, coincidentally fell on the same weekend as Rosh Hashana. 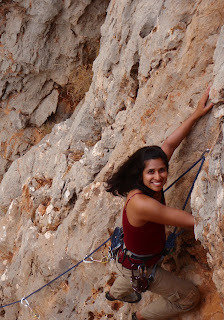 When Naz invited me to stay at her place in Abdoon for the weekend, I was put in the position of having to choose between the Jewish high holidays and rock climbing; as many of you might expect, I chose rock climbing. My family in Haifa had invited me to spend the New Year with them and as a sort of Jewish-guilt-inspired compromise, I had dinner with them Thursday and spent the night in Haifa before heading over the border on Friday. My family-in-Israel could not understand the appeal of Rosh Hashana in Jordan; in fact they seemed utterly perplexed at the idea that I had friends in Amman. “But, are they Jewish?” I was asked more than once, reminding me of the reality that, despite a formal peace agreement, these nations are still pretty darn isolated from one another. Just for the record, traveling through the West Bank and across the Allenby Bridge on a day that happens to be both the last Friday of Ramadan as well as Rosh Hashana is not a great idea. I mean, I knew this before I tried it, but I figured that as long as I called the border control office at Allenby to cofirm their operating hours [8am-1pm] things would work out okay. They did work out…but with a little more hassle than usual. The first step: getting from my family’s house in Haifa to the Damascus Gate to the Old City in Jerusalem, was easy. However, when I headed over to the Arab bus station to catch a ride to Allenby, I was surprised to see that there were precisely 2 buses in the entire station. One was parked, driver-less, and out-of commission; and the other was leaving for its final trip of the day to Ramallah. I stopped the driver and asked him how I could get a bus to the Allenby Bridge, to which he replied that I couldn’t…at least not that day. Well, I stopped a random East Jerusalemite and after posing the same question, he said that I might be able to hire a private taxi, but he wasn’t sure they would go during prayer time on Friday. [I have to say, G-d/Allah/Jesus/etc certainly makes public transportation complicated.] After several follow-up conversations with men standing near taxis, I found a guy who said that he wouldn’t take me but that he knew someone who…for a premium…might. Since I had to make it to Allenby by 12 and was beginning to run out of time, I agreed. I was introduced to Mr. Taxi Driver’s Friend, who ushered me into a private car that was completely blocked into its parking spot by several other vehicles. I watched through the rear windshield as 6 Arab men and two small boys jumpstarted the truck behind us by pushing it backwards [uphill] and letting it roll back down [directly towards me in the backseat of Mr. Taxi-Driver’s-Friend’s car]. After a few tries, they managed to get the truck started [and, praise Allah, to prevent it from slamming into me] and before too long we were on our way. I’m not gonna lie – I was pretty nervous the entire ride. Here I was, alone, in an unmarked private car with some guy who wasn’t really a taxi driver. Probably not a good idea, but I took some comfort in the fact that I had agreed to pay a ridiculously inflated fare and it was only a half-hour ride. The driver was making bank off me; he knew it and I knew it. Plus, he was really old and frail and had been very nice to me so far. While the situation was, admittedly, not ideal…I didn’t feel like I had any reason not to trust that things would work out okay. That said, I was, over the course of the ride, continuously rehearsing escape scenarios in my head. Everything went very smoothly until we arrived at a checkpoint 3 km from the Allenby Bridge. Before going through the checkpoint, Mr. Taxi-Driver’s-Friend pulled over and ordered me to get out of the car. I was like ‘um…we had a deal…I pay you more than we both know this fare is worth and you get me to the Bridge before 12; we’re not at the Bridge, so I’m not going to pay you.’ This proclamation really seemed to piss him off, but I stood my ground. By this point I felt pretty safe – I was out of the car, bag in hand, and there were lots of other people around [including Israeli military police.] My driver stood his ground as well, explaining [with an air of apology this time] that he couldn’t take me any farther [my assumption is that he couldn’t go through the pre-border check point because he wasn’t really a taxi driver or didn’t have the right kind of ID or something, but I’m not really sure.] Anyway, he eventually found some other taxi driver [this time with a real taxi] who, I guess, he convinced to take me through the check point and to the border. I felt like, at this point, this was my best option to get to the border before 12, so I paid the first driver and got into the car of the second. A little hassling by the Israeli military police at the check point inspired Second Driver to turn around and angrily express [with an exasperated yell] that he didn’t want to take me to the border, but he did, and I paid him too, and the rest of the ride to Amman was relatively easy: Israeli border control, exit fees, customs, short bus ride, Jordanian border control, taxi to Amman, local taxi to Naz’s place. Even with the added complication of Ramadan/Rosh Hashana, I was chatting with Naz in her living room by 1pm. Rosh Hashana [Friday night] was celebrated with an amazing Iftar meal at a fancy Lebanese restaurant downtown. Naz and I were joined for dinner by Peter [my friend from MIT], his roommates Tom and Alicia, and a few other friends. 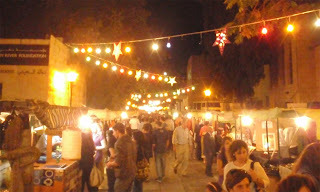 After dinner we wandered around Souq Jarah for a bit before calling it a night. Saturday morning, Naz and I went to Kufranja with another American named Brit. We repeated some of the lines we climbed there last time, and tried a few new ones. Saturday night we had dinner at Yoshi, a trendy [and excellent] sushi place. Omg, my first non-Middle Eastern restaurant meal in 2 monts tasted soooooooooooo good. Sunday we actually opted for something other than rock climbing. I know…crazy. 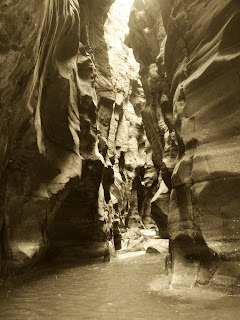 We drove down the Dead Sea Highway to a canyon called Wadi Mujib and did the Siq trail, a two-hour romp though rushing water. 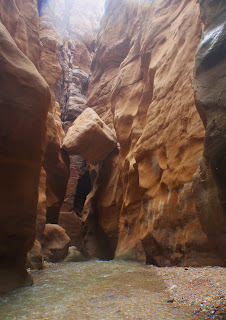 Although Mujib doesn’t seem to be a big deal by Jordanian standards [as I learned later, from a local canyoneering guide] I thought it was really cool! 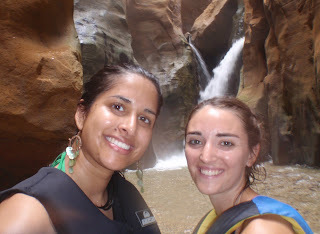 Naz and I at the end of the Siq trail. On the way back to Amman we stopped in Madaba for more excellent Lebanese food. 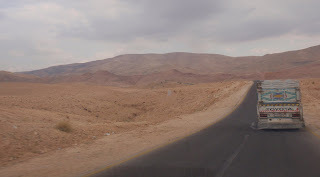 This is a photo I took from the car on the drive to Madaba, in a landscape that looks more like the middle of nowhere than anywhere else I’ve ever been. All I could think about while driving through this vast empty barren desert was how close we were to the Church of the Holy Sepulchre in Jerusalem. One of the chapels in this church is built around the precise spot that Christians believe is the center of the Universe [a nearby chapel houses the body of Jesus Christ]. Thinking about the uncanny proximity between the Center of the Universe and the Middle of Nowhere was almost too much for my brain to handle. 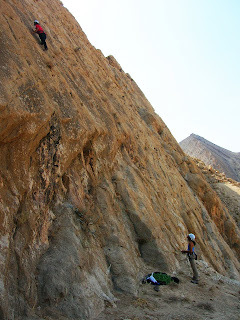 Moday was a climbing breakthrough – we found ourselves, suddenly, smack in the middle of the Jordainian climing scene. 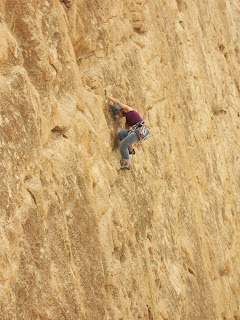 Granted…it’s a limited scene…really limited…as in…there are basically like 5 climbers in Jordan, not counting expats. 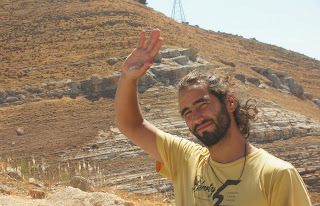 Hakim is a Spanish-Jordanian climber who lives in Amman. 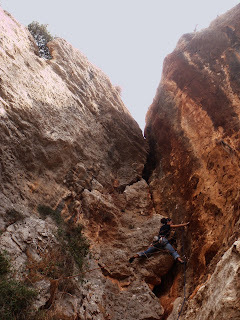 He was trained by a French climber in Verdon, has an adventure tourism company called Tropical Desert Trips, and is in the process of establishing numerous climbing areas in the north of Jordan. 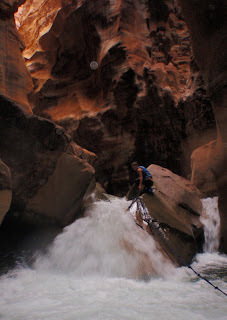 Mohammad Hamad is a Bedouin climbing guide in Wadi Rum, trained by British climber Tony Howard. Mohammad has put up a ton of stuff in Rum and is, coincidentally, who Naz and I met two weeks ago down South. According to Hakim, there are a few other Bedouin climbers in Rum, all of whom claim to be the only one, and each of whom trace their climbing lineage [and training] through a different European climber. There seems to be a healthy amount of competition amongst all of these characters. Afterwards, we went back to Hakim’s “office” and tried out his artificial wall, which turned out to be surprisingly fun. The wall is outside, on the side of the building that he lives in and works out of. The routes snake up a wide variety of “holds” – from molded plastic crimpers, to drilled sandstone jugs, to features and cracks in the crumbly concrete. 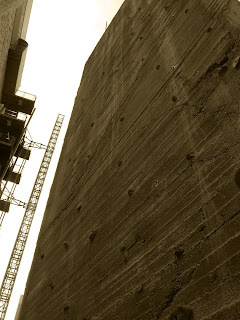 I don’t know if it was because we were climbing up the exterior of a building, or because the concrete features I was toeing were crumbling underfoot, but Hakim’s artificial wall felt more like real rock than most gyms I’ve been to. What Hakim is trying to do is really cool, but it also seems like an uphill battle. Local Bedouins have a habit of bolt chopping, and most Jordanians don’t [yet] seem to understand the appeal of rock climbing. 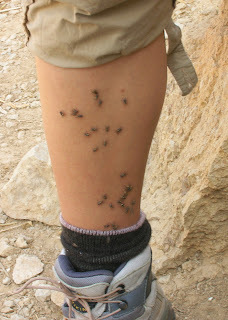 From conversations with Hakim, it seems like there is a heavy skepticism about the invasion of this very Western outdoor activity into an Arab culture that is still quite traditional. As a result, both Hakim and Mohammad seem starved for partners and gear, and enthusiastic about climbing with and learning from foreigners. Monday afternoon I helped Hakim set a new boulder problem at his wall and introduced him to the art of campusing. That night Naz and I were invited over for pizza and beer at the home of some of her expat friends. The pizza, from Papa Johns, tasted exactly like it does in Worcester and I couldn’t stop thinking about how surreal my trip to Amman had been so far – about the strange bubble of expat/American/rock climbing subculture in this Arab city. 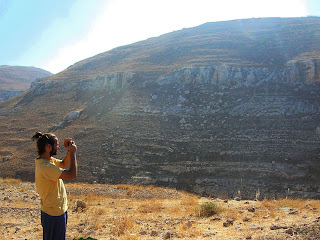 I felt like I had left Israel in so many way – the crazy religious politics were gone and there were no Jews in sight; staying in Abdoon felt like the opposite of Sde Boker – an upscale neighborhood in a big city with fancy import grocery stores and crowded trendy restaurants. But the funny thing was that I had left Israel for something that felt closer to my life in the U.S. than to the Arab world. I was spending all my time rock climbing [something I missed tremendously in Israel], hanging out with Americans and climbers, and now…eating Papa Johns? It is a surreal experience to find yourself somewhere completely foreign, but in some ways, it is even more surreal to find yourself somewhere completely familiar…in a place that should feel foreign. I suppose this is globalization at its finest…or at its worst. I was planning to head back to Israel on Tuesday, but then Hakim offered to take Naz and I to a new areas he’s developing near Fuhais, which is about 30 minutes from Amman. Feeling the tug of responsibility, I initially resisted, but then I thought about how empty campus would be [given the high holidays] and remembered a conversation I had with my advisor last week during which he told me he couldn’t possibly meet with me before October 4th. 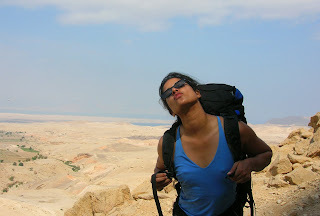 I pictured myself, alone in the desert, working on my laptop in my room in the guest house, wishing I’d gone climbing, and then decided to stay in Amman another day. 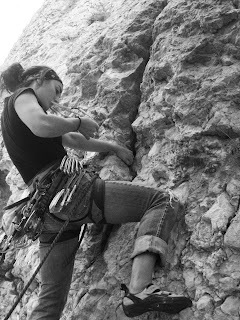 It’s okay, I can admit it…I have little self-discipline these days when it comes to rock climbing. Fuhais was awesome; these pictures really don’t do it justice. There is a huge gorge, dotted with limestone bands and freestanding boulders. Hakim said he and the other guys from Tropical Desert are basically the only climbers who go there. He’s put up a few single-pitch lines [some of which we did], but looking around you get the sense that he’s established maybe 1% of the potential lines. We even did an f.a. [well, sortof…in actuality, we scouted a new line on tr because we were worried about loose rock]. I spotted a layback/undercling line up the side of a big flake and it turned out to be really fun. I know it’s lame not to go ground-up, but it seemed like there was a real possibility that the whole flake might fall off, eliminating not only the hand holds but also all of the potential gear placements, so we opted for bad style/less death.